The NMI you know and love has been shaped by nearly 20 years of faculty, staff, and students dedicated to making something work, then making it work better. Few people embody this motto more than Clate Sanders, one of the NMI’s first faculty members. You may recognize the name from the coveted “Clate Award” presented each semester to a Capstone student who demonstrates persistent hard work and unwavering dedication throughout their project – qualities Clate continues to exude. Last month, Clate returned to his old stomping grounds to speak in Digital Brown Bag about an exciting project with San Fransisco’s Computer History Museum. Back in 1990, just before the introduction of the World Wide Web, Clate worked with CNN and Apple to create News Navigator, which featured the first public display of video on a computer. 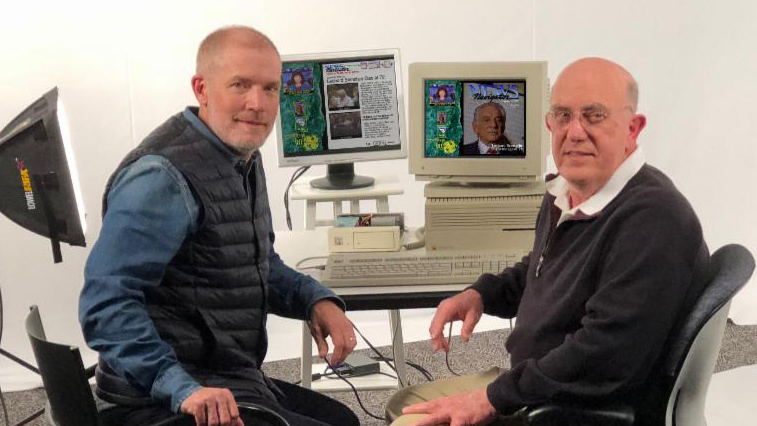 The online magazine only ran for the four days of the 1990 Educom conference, but it was a huge step on the road to QuickTime and what we know as digital video today. Nearly two decades later, Clate’s hard work, archived files, and ancient computer hardware is being resurfaced for the public eye. Recognizing Clate’s impressive contributions, the Computer History Museum has invited him to the West Coast to present on his monumental project and build out a permanent exhibit among the museum’s tech-centric collection. Congratulations, Clate, and thank you for helping shape the NMI into what it is today!